The day when Japan conceded its defeat was called "Victory over Japan Day" and commemorating events were held in some big cities. Ratnapura was one of those cities and Somasiri Devendra lived here. His father addressed on behalf of the people in Sri Lanka after the speech of the representative of Great Britain. Our colonial master, Great Britain, won the war and we got together to celebrate it now. However, we were inspired to have patriotism for our own nation, Sri Lanka. We are ruled by Great Britain right now and this condition is insane. The concept of patriotism that all of us should imprint into mind, spread to other Asian countries by Japan. This war gave consciousness of confidence and nationalism to the people in Asian countries, Indonesia, India, Sri Lanka and Burma and so on. We should appreciate Japan for this fact. His act was amazing and audacious. He thanked Japan on the Victory over Japan Day in front of officials of Great Britain. It might be his unstoppable exploding emotion. Sri Lanka managed to get independent on Feb. 4th in 1948. After the war, in the court martial, Great Britain tried to punish the leaders of the Indian National Army that had been supported by Japan during the war. However, this attempt became a trigger of nationwide riots and the general strike spread across the country. This national movement ended in the acquisition of independence. Great Britain got out of the country. A young boy, Junius Richard Jayewardene, who had been at the harbor to have a quick look of the Cruiser which Japanese Prince Hirohito had been aboard was in an important position of the independent government of Sri Lanka at that time. He got to give the speech supporting Japan in the San Francisco Peace Conference later. Japan has continued to encourage the people in Sri Lanka to become independent since Meiji era and Sri Lanka helped Japan to restore the independence after the World War 2. Don't you think it is a beautiful, secure and heart-warming relationship? I'd like the people in Sri Lanka to find these 8 articles that I have written in the past several days. If you are from Sri Lanka or India or any other Asian country, don't hesitate sending an e-mail to me. I'm looking forward to hearing from you. I'm eager to know how your daily life is. I've not received e-mails from Indonesia or Sri Lanka since I started writing this blog. Don't bother writing beautiful or grammatically complete sentences. I'm a beginner in writing in English. I'll show you a beautiful picture in this entry that was shot last Sunday. It was overcast and about to start raining, but you can see a part of the bridges. The narrow channel in the picture is called Kurushima Kaikyo, and is famous for one of the hardest channels to pass through. I want lots of people to see this scenery and will attach it on the Google Earth later and you can figure out where it is located. Roughly speaking, Japan consists of four islands, Hokkaido, Honshu, Shikoku and Kyushu. A battery of bridges connect Shikoku and Honshu from island to island. This picture was taken from a viewpoint of Shikoku. 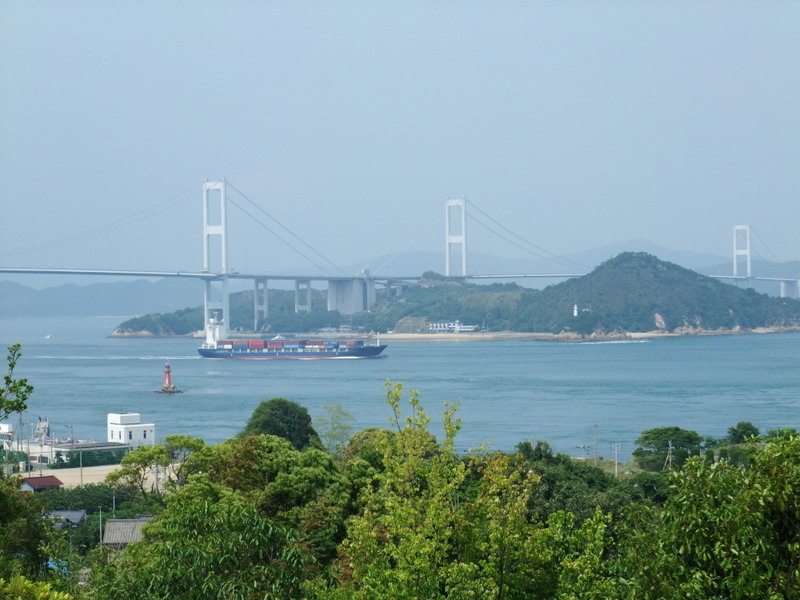 Shikoku and Honshu are bridged in three routes. One of them is here. The large-scale one has two layer structure and is 200km east from here. Cars and trains, including Shinkansen super express could pass on the bridge. If you have a chance to see it closely, you would be astonished by its magnificence. The people in Sri Lanka were cheering for Japan and feeling sympathy at the same time in 1941, when Japan started to fight the Allies. At the beginning of 1942, Japan's Navy was very strong and beat enemy's vessels on the Indian Ocean one after another, but unfortunately for Japan, those ships were old-fashioned and were built in the era of World War 2. On April in 1942, they finally reached Sri Lanka and battered military ships of Great Britain anchored in Sri Lanka. This aviation unit was transferred from the Pacific Ocean just after the sudden attack at Pearl Harbour, and their bombing technique was supposed to be the No.1 in the world those days. There is a tomb in the official cemetery in Colombo. That is for the three Japanese soldiers who crashed at that time. Japan attacked and seized Singapore quickly, and after that, gathered deserted Indian soldiers and made up the Indian National Army out of them. Their purpose was to get the freedom back from their colonial master. Part of the army consisted of Sri Lankan soldiers, so they started broadcasting toward the people in India and Sri Lanka. 12-year-old Somasiri Devendra often listened to this broadcasting, Radio Singapore. It began with this phrase, "This is radio Singapore, broadcasting for brothers and sisters in India and Sri Lanka," and often aired songs that encouraged the people in India and Sri Lanka. This airing was supposed to change the mentality of those people. Do you know Ekiden? It's one of the sports that originated from Japan. At first let me explain the word "Ekiden". "Eki" means "station" in English and "den" is "inform". Long ago, when you had to send some information to places far away, the letters and parcels were sent to the next stopping point one after another by horses. That is to say, a long distance was divided into small parts and stuff was transported section by section. The name of "Ekiden" was born from this system of transportation. Now, today, my daughter sent me a picture with a certificate that showed the record of her group. I'll show you below. 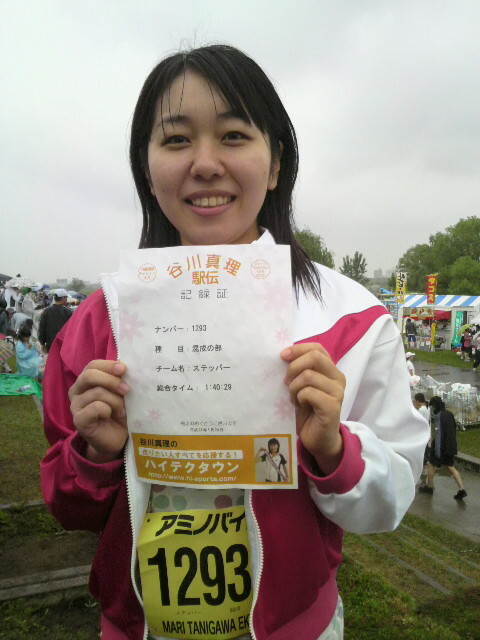 It seemed like she joined the ekiden with her friends. It looked like a charity race. One of the famous marathon runners, Mari Tanigawa ran 20km by herself and other people competed with her by making up a team that consisted of four people. My daughter sounded like she enjoyed the race. The number of the participants seemed to be more than 1000 teams, I mean, more than 4000 people. Wonderful! Our traditional religion, language and customs were at the brink of extinction under the long-lasting rule of foreign countries. Not only our people, but also all the people in Asian countries which were suffering the same problem, had admired and respected Japan for a long time. Japan was the only independent country among the Asian countries. In the era when superpowers were arrogant and ruled the world by their military power and unfair trades, you competed with them, ranked with them and sometimes beat them. When you stopped over at Sri Lanka in 1921, I got carried away and went to the harbor to glance at your ship. Japan began to appear on the stage of world affairs those days after the victory in the second world war. Japan fought with Great Britain under the Anglo-Japanese Alliance and just started being acknowledged as one of the strong countries. Japan was one of the Asian countries and had the culture of Buddhism, just as Sri Lanka. The prince of Japan at that time had been heading for their equal partner, Great Britain, with their own cruiser. This event must have encouraged the people in Sri Lanka, who were eager to get their independence. If I'm ever reincarnated, I wish to be Japanese! Anagarika Dharmapala (1864-1933) witnessed remarkable progress of Japan during his three visits. He got to think about the necessities of education of techniques in various fields in order to become independent from Great Britain, and he established a financial group for the purpose of sending young Sinhalese to Japan. His last visit to Japan was in 1913 and he dropped in at Korea and Manchuria on his way back to Sri Lanka. Japan had invested a generous large sum of money in developing these countries at that time. He pointed out the difference between the policy of Japan and that of Great Britain, which had looked at Sri Lanka only for the purpose of ripping them off. He said that it would take more than 50 years for Great Britain to accomplish what Japan had done in just a few years. His activity had caused the resurgence of Sinhalese nationalism based on Buddhism. The colonial authorities of Great Britain feared him and took him into custody for five years. His younger brother was also arrested and killed in jail. Nevertheless, he didn't give up his action and died at the age of 69 in 1933 before the independence day of Sri Lanka. He used to say that he wanted to be re-born as a Japanese person if he could. A man took action in the end of the 19th century to bring Buddhism back, which declined to the brink of extinction under the colonial rule of Great Britain. His name was Anagarika Dharmapala, who is called Sri Lanka's founding father. He was born in a deeply religious Buddhist family, but was named David under then strong influence of Christianity. He hated his name and changed it to Anagarika Dharmapala. Anagarika means "priest" and Dharmapala means "guardian of the law". He first visited Japan in 1889, when the ceremony of promulgation of the Constitution of the Empire of Japan was conducting. I'm sure he looked and felt the fetal activity of modern Japan. He visited Japan again in 1892 and 1902. Two months before his third visit, the Anglo-Japanese Alliance had already been signed. He made a comment about the role of Japan as a member of Asian countries. He insisted that Japan should save all the Asian countries, in the midst of agony, of being colonized and wipe racial discrimination out. Two years later, Japan waged war against one of the superpowers, Russia, and beat it down. The people in Sri Lanka got carried away to hear the news of annihilation of Russia's Baltic Fleet, which had just passed by their island to attack Japan. His comment: It's the best news in our history. You might not be aware, but Japan brought us back from the brink of death. I guess, Japanese people of that time probably wondered why a Sri Lankan diplomat cheered for Japan like that. The answer will appear if you see the history carefully. Let's look at the history. The word "Sri Lanka" means, "shining island", and the country is also called "Pearl of the Indian Ocean" from its rich nature. There are 20,000,000 people living on the island. At about 5th century B.C., Sinhalese immigrated from northern India and built a kingdom. After being affected by Buddhism in the 3rd century B.C., they kept Buddhism as their backbone. However, Sri Lanka has always been an important hub of trade on the Indian Ocean and had been exposed to the invasion of European superpowers. The Portuguese stepped onto this beautiful ingenuous island in 1505 and had ruled the seashore area for about 150 years. The ruler was replaced by the Dutch in 1658 and they became the colonial administrator for about 140 years. After that, Great Britain came to the island and seized the control of the whole island in 1796. This cruel superpower generated the agony that has been continuing up until the present. They changed this whole island into the factory for their tea and the result was that people had to import even their fundamental food, rice. The big insurgencies broke out three times, but all of them were suppressed by military means. Great Britain gave favorable treatment to Tamils immigrated from southern India, educated them, adopted them as officials and made them rule the majority of Sinhalese. This clever divided government is the source of the present ethnic strife. At the same time, they gave a warm reception to Christians and suppressed Buddhists. Sinhalese were Buddhist and had no chance of education. He expressed his approval for the Peace Treaty and then told the reason: Why do Asian people have interest in the freedom of Japan? It's because of the long-lasting relationship between Asian countries and the Asian peoples' respect for Japan. When most Asian people were under the rule of the superpowers and spent their slave-like days, Japan was the only Asian country that was strong and free, and was looked up to as a sort of a guardian or sworn friend. The Great East Asian Co-prosperity Sphere, the slogan of Japan in WW2 was so attractive for slave-like people that some leaders of Burma, India and Indonesia thought that their countries could become independent from their colonial masters. So, those leaders joined their hands with Japan. I clearly remember these historical facts. Actually, the representatives from struggling countries, in order to get out of the rule of European superpowers, got together in Tokyo and the conference was held. Besides, Burma, India and Indonesia could have their own military supported by the Japanese Army and these militaries played a big role for their independence. The representative of Sri Lanka, J.R. Jayewardene, declared to waive the right to claim compensation quoting Buddha saying, "Animosity can be removed only by Love." After his speech, shouts and applause of praise almost blew the glass of windows （San Francisco News）. A dark-skinned, nice-looking diplomat came from Ceylon and preached loudly, modestly, and tolerantly between countries which were almost passed over, and lastly broke the plot of Russia by his smart and intensive theory （San Francisco Examiner）. Consequently, 49 countries (all but Russia, Poland and Czechoslovakia) signed the Peace Treaty and Japan became independent on Apr. 28th the next year. Today was really windy. We seldom have such storm-like days except for when there is a typhoon. So I just kicked back at home. I've seen google maps moving on some private web pages. I really wanted to know the way to make up such web pages and was surfing on the net. I eventually found some fantastic software called "Wadachi". This Japanese word means tracks. I downloaded this software at once and made the following web page. It is the report of my short tour on April 19th. See http://kumo.typepad.jp/wadachi/kinzan_shussekiji_temple.html It's wonderful and just what I wanted to make up. Some parts are written in Japanese, but I think I can modify the template into an English version by myself for everyone in the world. Please enjoy my report, zooming the map in and out, and you'll know where it is on the globe. Today's CNN says, "SRI LANKAN PRESIDENT DECLARES WAR 'VICTORY'". President Mahinda Rajapaksa declares victory in Sri Lanka's 25-year civil war against the Tamil Tiger rebels. The rebels must have had their own opinions and I don't know if this result is good or not for all people in Sri Lanka. However, at least, the war came to an end. When I read this news on the web, I thought it is the chance to inform all the people of a story about the relationship between this country and Japan. Japan and Sri Lanka share the long lasting history of friendship. I'm showing you the story in several parts. The Sri Lankan representative, Junius Richard Jayewardene started his speech on Sep. 6th in 1951. at San Francisco Peace Conference, where the representatives from 51 countries got together and argued about the independence of Japan. A proposed treaty was ready mainly by the U.S., but the USSR was interfering with the treaty. At first, he said that he was the representative from Sri Lanka, but he could also make comments about the feeling of other Asian countries. He continued that most Asian countries were encouraged by Japan when they were occupied and exploited. We should lift the occupation of Japan and make it independent. I've installed and have been using a wireless keyboard and mouse for a few weeks now. Though the former ones weren't broken, I just wanted to use them. 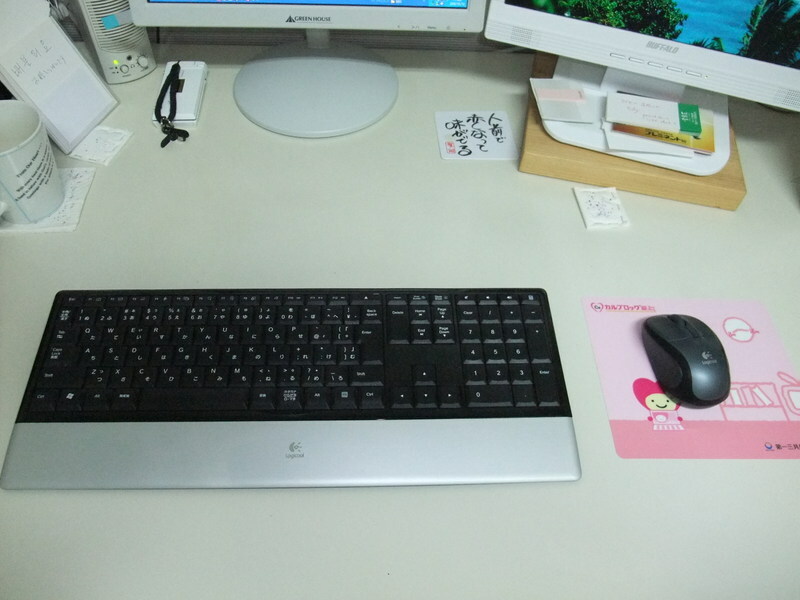 If I had to criticize the former keyboard and mouse, the noise of typing was irritable and the cords of the keyboard and the mouse were annoying. My impression is that they are great. I've never thought of the advantages of the wireless accessories. It's easy to clean up the desk. When I wipe the desk, I temporarily can put them away. I can type the keys while leaning back on the chair. It means that it's convenient when I watch a movie on the PC. I often changes subtitles between Japanese and English. Watching American movies is also one of the ways of learning English. I can learn some expressions with their situations around. The words on the pages of the dictionary seem to be as dry as an old bone to me. Quite a few people have visited my blog via automatic translation sites in recent days. I'm flattered by the number of the visitors, but I'm afraid that the automatic translation is under development right now and I wanted to inform them of my exact opinions. So I decided to revise categories and add Japanese translations for the category of opinion. Besides, the classification of my entries has got unreasonable now. I started checking the categories of the former entries at the beginning of May, and will finish it by the end of June. When I counted the number of the entries in early May, it was 780! and I felt a deep emotion. At the same time, I made up my mind to try more difficult topics from now on. 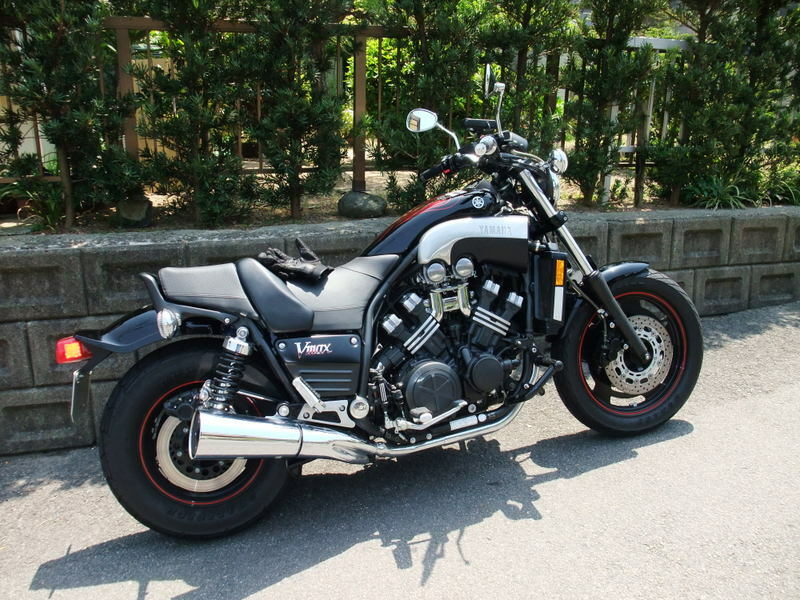 The picture is of VMAX, a 1200cc motorcycle, which is my brother's. I borrowed it this afternoon and took a short ride. I got an unlimited license for motorcycles recently. It was not easy, but I got it in order to ride this motorcycle. This is so heavy that I managed to put up the center stand only after a great deal of effort. However, once it started, it was so light. 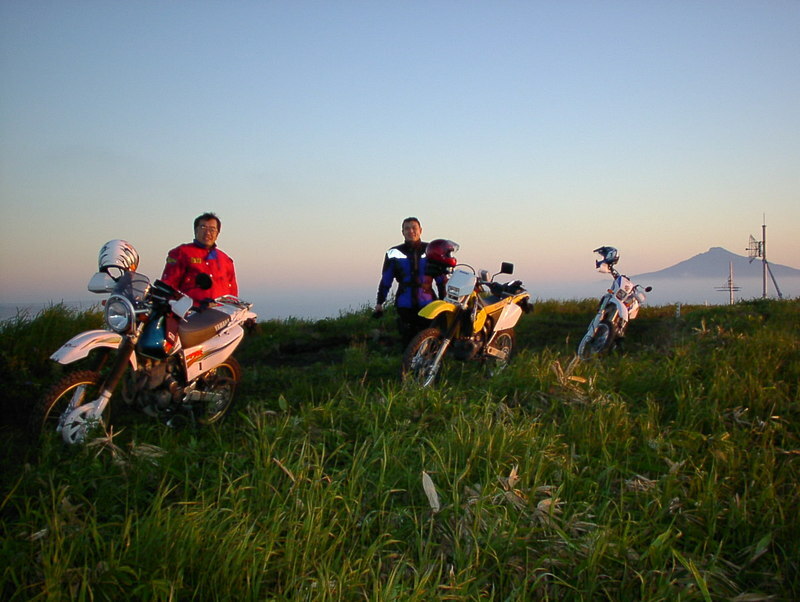 I felt a comfortable sound and beat from the heart of the motorcycle. Its accelerating force was so amazing that I've never felt before. I became eager to have my own super-big motorcycle. I almost got addicted to its power. My daughters, who are the granddaughters of my parents, look adorable to their grandparents, though my daughters have already grown up. As soon as they heard their first granddaughter, Eri, was coming back home, they prepared for a party to welcome her. They invited some relatives and hosted the party. It was fun grabbing a beer with them. 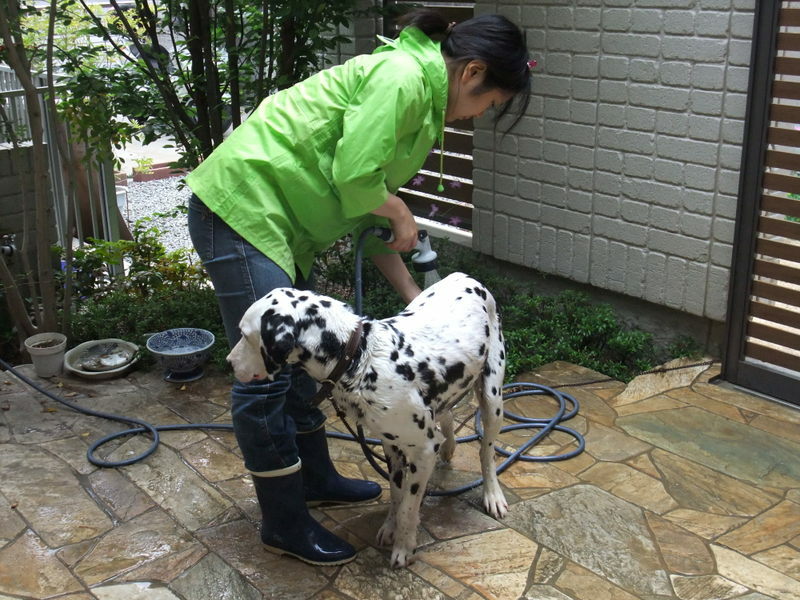 Today was a really warm day, and A started shampooing Mocha, which is the name of my dog. A is a typical animal lover. It looks like Mocha knows it and he stays still in front of her, whereas he doesn't like an electric dryer and I always have the role of dryer. I have to undertake the work that is hated by Mocha all the time. May 3rd is Constitution Memorial Day in Japan, which took effect on this day in 1947. This day has been celebrated every year. I was taught that this constitution was perfect and much better than the former one. It declares strongly that Japan renounces the sovereign right of the State to use war as a means of settling international disputes. Japan is the country that never wages war. I had been proud of this constitution until several years ago, when I investigated by myself how it had been drawn up. At the beginning of the Meiji Era, some politicians struggled to make up the Japanese constitution. They took years to look around the developed countries and do research into the constitutions of those countries. I learned of this process in my history class, whereas the process of drawing up the present Constitution was ambiguous in compulsory education. I tried to find out who drew it up and was surprised to discover that it was several officers from the U.S. who drew it up. They were rank amateurs. Since then, this constitution has been preserved untouched for more than 60 years. Incredible! Japan has developed from its devastated status during this 60 years. This outdated constitution has become the obstacle for many activities now. I feel the necessity of modifying it. I'm writing about this issue later. Firstly, I like the U.S. and I don't mean to hurt any American, but I'm going to put forth my idea about them. Generally speaking, most Americans seem to think it natural to be able to speak English. If I get tongue-tied trying to answer a complex question, they usually talk to me loudly. It's because they thought illogically that I couldn't hear their voice, though I couldn't actually understand their words. On the other hand, it was not common in people from European countries. Their response to my words was usually kind. I felt like that again the other day when I chatted with some German people. See Freiburg. In the cultural aspect, the situation is likewise. I remember I was astonished to be asked if Japanese people eat turkey at Thanksgiving by a young American, who had come to Japan as an assistant language teacher shortly before. Needless to say, but this "Thanksgiving" originates from the historical fact that people who immigrated from the Old World were helped to survive starvation by natives and celebrated their first harvest. 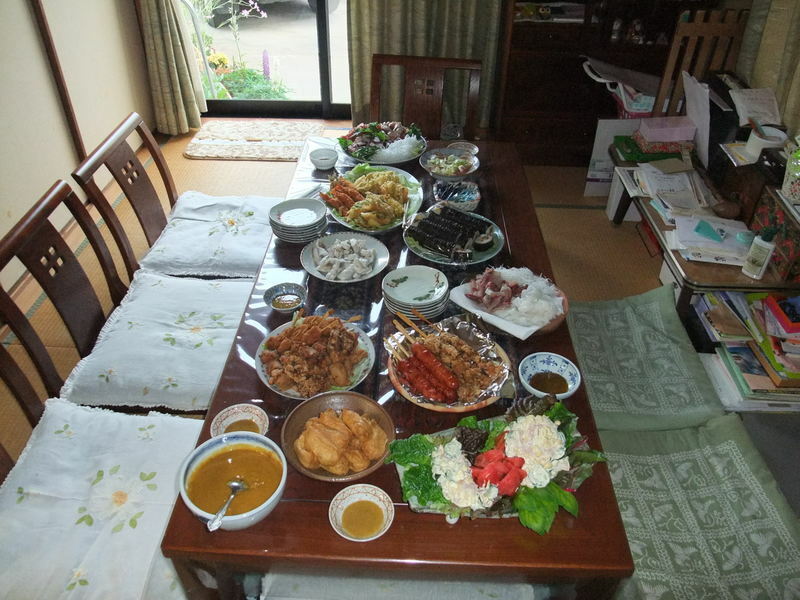 Thanksgiving, the custom of the young nation, the U.S., cannot be celebrated in Japan which has a much longer history. The question was total nonsense. It was just like I asked how the U.S. celebrates the birthday of the Japanese Emperor. It seems to me that they believe that the common sense of the U.S. is directly the same as that of the rest of the world. The mixture of this arrogance and pure mind might be the basis of their general way of thinking. There are many viewpoints that these Americans can't perceive. For example, the helplessness, agony and chagrin of being bombed, being occupied and being silenced. Additionally, the non-Grecian, Roman perspective of the world in which the truth is not the same. I can rewrite it as non-Jewish, Christian or Muslim. Americans who believe in only one truth and justice never accept the multiple truth and justice that Japanese people, who see gods in the universe, think is good enough. I sometimes feel that the causes of lots of conflicts in the world might arise from this stubborn world-view. If my speculation is correct, bi- or multi-cultural views have a role to build peace in the world. If you want to acquire this viewpoint, you should learn your mother tongue and culture at first, and consequently should have a rock solid identity. I also think it's the reason why Japanese Americans and children returning from abroad can't have the bi-cultural view. For this reason, I'm against the present current situation that makes children start to learn English at about 10 years old before acquiring their mother tongue. This education would after all produce imperfect citizens. It would be the people who got their identity as Japanese, while performing several activities using English acquired through hard work, who can explore the future of Japan by promoting the multi-cultural view in their daily life. Critics of the system were quickly silenced.